"If you think education is expensive, try ignorance", is the first line in a whitepaper introducing our JARIS knowledge management system many years ago. It is still applicable today. Much of the efforts in organizations of all sizes revolve around reducing costs, becoming more lean, and working smarter. Although it is hard to consider a training department as a revenue stream, there are ways to empower Learners to transfer some of the direct costs (time) of training. Besides, there usually isn't any alternative to training, especially if you have a workforce with high turnover. To be successful, you must provide training resources over the full lifecycle of an employee. By understanding and applying the correct strategies and tools, you are more likely to quickly realize a return on investment (ROI) as well as a reduction in future costs. It has really amazed me that large companies (some our clients now) have spent millions of dollars licensing tools and implementing systems without having an overall roadmap strategy for how the tools and systems fit in their environment and what problems they address; then, because of the cost, there isn't enough budget to create learning resources and training content to be successful. As illustrated in the image below, certain challenges arise over the lifecycle of an employee, from the initial new-hire stage to attrition. The employee’s needs will change over time also. You wouldn't send all your seasoned employees through new-hire training after they return from vacation—they don't need that type of training anymore. Also, many companies train employees in batches rather than delivering training just in time. 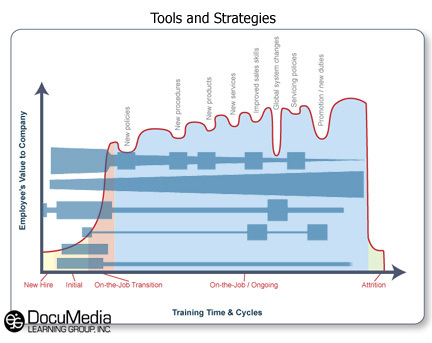 The strategies we use address a specific stage of an employee and a specific gap as illustrated by the darker blue overlays in the Tools and Strategies image. The larger the cross-section, the more applicable the strategy and tool is in providing a solution. One specific solution is illustrated by the wedge, which is the second object from the top that is smaller at the new-hire side and largest before attrition. This strategy and the associated tool is the knowledge management system JARIS (Job Aid Reference Information System). By training a new hire how to use JARIS and publishing the necessary knowledge therein, you empower the employee to find and use information as needed and reduce the need for additional training over the remaining lifecycle. Another, more common approach is to provide web-based training (WBT), which is represented by the top-most dark blue object. These are just two of the strategies for solving training gaps, and DMLGroup uses these strategies to reduce training time, increase employee contribution, and add value to our clients.